(Left to right) Maia Davies, Lola Doyle, Matthew Sheppard, Stephen Lee, managing director of Bradford Exchange, Theresa Barrett, stable manager of The Horse Rangers Association, Caitlin Aldous, Hollie Driver, and Abi Evans pose during the launch of the gold quarter sovereign to feature the portrait of the Queen on horseback, released by The Bradford Exchange at The Horse Rangers Association, Royal Mews, Surrey. Photo credit: Steven Paston/Press Association. Collectibles firm The Bradford Exchange has released a brand new gold quarter sovereign to commemorate the Queen’s Sapphire Coronation Jubilee, marking Her Majesty’s incredible milestone when she became the first British monarch to reach the 65th anniversary of their coronation on Saturday 2nd June. The 2018 Gold Quarter Sovereign features a portrait of the Queen on horseback, recalling a similar image which was used on the first commemorative coin of her reign, the 1953 Coronation Crown, and then on subsequent coins celebrating her Majesty’s Jubilees over the decades. However, this is the first time the equestrian portrait has been used on a gold quarter sovereign, making it a world first to mark this historic occasion. Only 2,018 gold quarter sovereigns are being issued, making this a limited edition coin that is expected to sell out quickly. 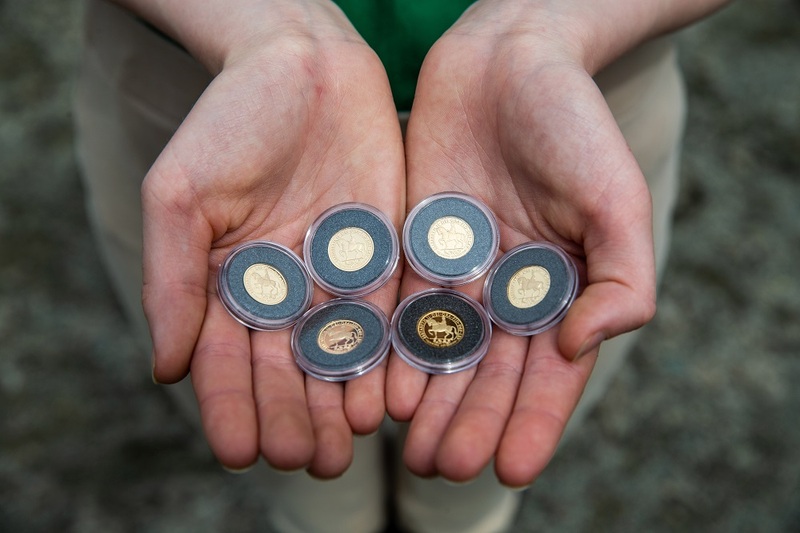 The coins are 14 millimeters in diameter, made of solid 22-karat gold, produced to Brilliant Uncirculated quality and are available for purchase for £98 exclusively at the website of The Bradford Exchange or by calling 0333 003 0019. In a fitting event for the official release of this unique coin, The Bradford Exchange presented one of them to The Horse Rangers Association at a ceremony at the charity’s stables at The Royal Mews, Hampton Court Road. In addition, they donated the other two coins that make up the full Sapphire Coronation Jubilee set, the Enthroned Queen half sovereign, and Double Effigy full sovereign, taking the full donation to a value of over £1,500. 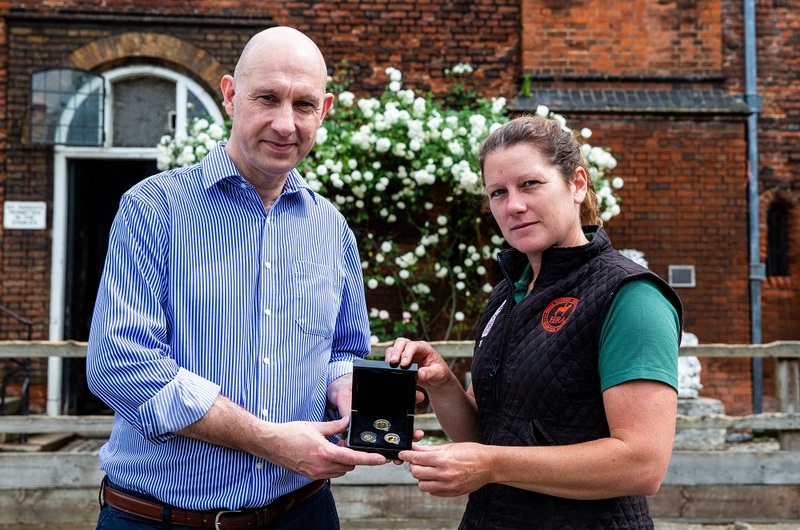 Abi Evans holds a gold quarter sovereign which features a portrait of Queen Elizabeth II on horseback during the launch of the coin with the Horse Rangers Association, at the Royal Mews in Hampton Court, Surrey. Hover to zoom. Photo credit: Steven Paston/Press Association. The Horse Rangers Association was chosen to receive this donation as it is dedicated to supporting children and young people from all backgrounds and abilities by giving them the opportunity to develop confidence and life skills through learning to ride and care for horses. This is a cause close to royal hearts, with the Queen still enjoying riding at the age of 92 and with its patron being Her Royal Highness Princess Michael of Kent. Stephen Lee, managing director of Bradford Exchange presents to Theresa Barrett, stable manager of The Horse Rangers Association, during the launch of the gold quarter sovereign to feature the portrait of the Queen on horseback, released by Bradford Exchange at the Horse Rangers Association, Royal Mews, Surrey. Photo credit: Steven Paston/Press Association. 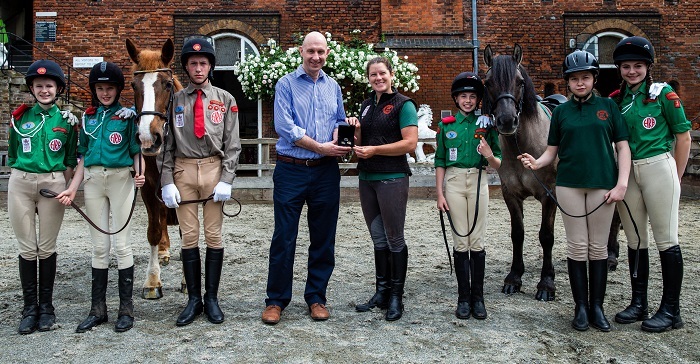 At the event, Bradford Exchange Managing Director Stephen Lee presented the coins to Stable Manager of The Horse Rangers Association, Theresa Barrett, in front of VIP guests and a number of the charity’s young members who benefit from its work. With the 2018 Gold Quarter Sovereign being a ‘world first’ with its portrait of the Queen in the saddle, we could not have found a more appropriate and deserving charity to receive this donation. 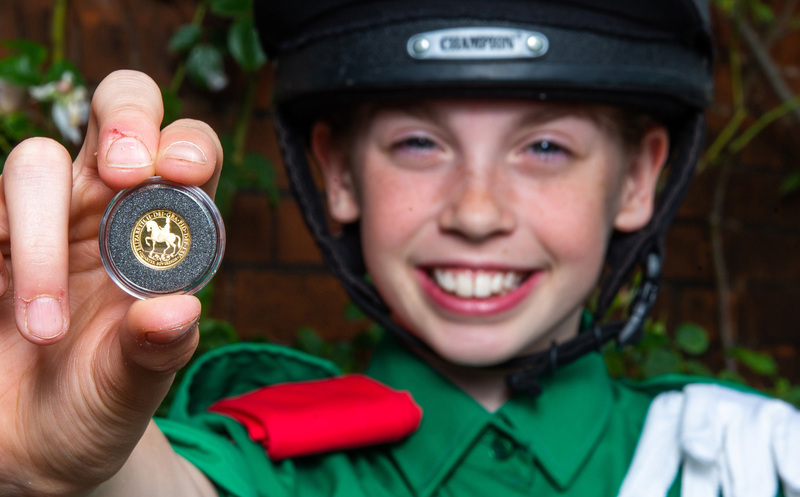 We are delighted that our coins will help The Horse Rangers Association to continue with the amazing support it gives children and teenagers, teaching them equestrian skills and responsibilities that help them build confidence and friendships that set them up for life. What a great morning! We would like to thank The Bradford Exchange for their kind donation as we rely on fundraising and public support to keep the stables going. Having met the Queen, I know how incredibly passionate she is about horses and the positive impact they can have in encouraging children to develop and grow as individuals. It was, therefore, an honour to receive this equestrian coin commemorating Her Majesty’s Sapphire Coronation Jubilee. General view of the gold quarter sovereign to feature the portrait of the Queen on horseback released by Bradford Exchange at the Horse Rangers Association, Royal Mews, Surrey. Photo credit: Steven Paston/Press Association. About The Bradford Exchange: The Bradford Exchange is a direct response collectibles marketing company, operating in 11 countries with over 16 million customers worldwide. Founded in 1973, the company spent two decades as one of the world’s largest supplier of limited edition collector plates. Since then, its quest to develop exclusively limited edition collectibles has expanded to include a diverse range of items. From sculptures and miniature models to home décor pieces, unique jewellery, and coins, The Bradford Exchange has set standards of excellence across the entire collectibles field. For more information visit the company’s website. About The Horse Rangers Association: The Horse Rangers Association is a registered charity based at the Royal Mews, Hampton Court. Founded in 1954, it is dedicated to supporting children and young people from all backgrounds and abilities by giving them the opportunity to develop confidence and life skills through learning to ride and care for horses. It relies on monthly subscriptions from its members for most of its income, supplemented by fundraising and charitable donations. The charity’s royal patron is Her Royal Highness Princess Michael of Kent. It receives no grants from the central government. For more information, visit the charity’s website. Press release courtesy of The Bradford Exchange and The Horse Rangers Association.